Why Do Banks Reject Business Loans? Why do businesses get turned down when they apply for finance? What can they do to change no into yes? And are there alternative finance routes for businesses that are rejected by the banks? Research found that 89% of small business owners have laid out strategies for growth, but 68% of them are missing the financial resources they need to execute those strategies. One clear and logical conclusion is that the economy, and jobs growth, are on a pretty tight leash. So what are the most common reasons loan applications from small businesses are rejected by the banks? And in our new economy, do alternative finance routes provide any advantages for the small business owner? Quality of earnings and quality of cash flow refer to earnings attributable to higher sales or lower costs – and not to profits that are not stable and core to the business, such as those resulting from holding back payments to vendors, and such as would be generated if a cafe were to sell off a property, for example. This is a big factor for banks, and it’s becoming increasingly more integral to the underwriting model for P2P. Banks required collateral for all loans of $1 million, the Pepperdine survey found; but they required collateral for only 63% of loans of $100 million. Here there is a significant difference between the banks and our P2P Lending model. Many small businesses do not have much in the way of collateral that can be used to settle with creditors if a loan defaults. We therefore do not usually reject loan applications on this basis. However, loans must be supported by a directors’ guarantee, and the combined estimated value of the directors’ net worth must at least cover the loan requirement. The debt ratio of a business is one of the most heavily weighted factors in our underwriting risk tool. Where a business is too highly geared and we are not able to help consolidate some loans, the business will usually fail our risk assessment. Here again, there are no significant risk assessment differences between P2P and the banks. However, with a highly geared business, we look at options around consolidating their debts with other lenders, to make managing their cash easier and cheaper; and following this, a business may pass our risk assessment. 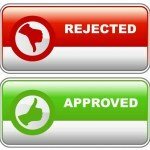 The top 3 reasons banks reject loan applications, account for 65% of all the rejected loans. The P2P underwriting model can answer effectively in some of these situations – notably in requirements for collateral; but still, P2P is limited by some factors in common with the banks. The advantages that exist emerge from the fact that P2P is geared to small businesses. Typically our borrowers are owner-managers with between 2 and 15 staff. In our experience, a passionate director with a track record usually impresses lenders more than does a CV-heavy board / management team. This is not usually a significant factor in our risk assessment, because there is a significant difference in the relevance of this factor across different sectors. However, lenders on our platform will often request more information on the clients of a business. We work primarily with businesses that are in their first 10 years of trading, so it is not unusual for applicants to have no business credit history. However, this does not mean they are not ready for it. It may be the case that a business will struggle to service the loan amount they are requesting, but a more manageable sum can help them build credit history and rapport with lenders, with a view to refinancing at a later stage. While we are all impacted by shifts in the economy, small businesses can be particularly vulnerable, so we’re not in the practice of calling in loans where we may feel exposed in a particular sector. Instead we look at alternative ways of supporting businesses through the difficult times, through our lender base and business aid / development contacts. Obviously, the nature of lending is such that we can expect some of the restrictions that exist in high street banking to exist also in P2P. After all, people need to know the money they are lending is fueling a sound business. But P2P is geared for small businesses. In these reasons, we can get some insight into how the differences and similarities in the approval processes of banks versus P2P play out.